Jesus It’s all about Jesus! Jesus was a man who claimed to be God. Think about it for a minute: if that were true, how would that change the way you think and feel about this life? Here in Gemeindezentrum Bethel, we believe that Jesus is God. We take Him at His Word. Therefore, in everything we do - it's all about Jesus. We are excited to invite you to learn more about Him and see how you can receive forgiveness and have a new life in Him. We love people. The best thing that we can give further is this unconditional love of God. We are convinced that His love is the answer to every life situation. Jesus has given us this great commission, as is written in the bible – to go and make disciples of all nations. A disciple is someone who loves God and people with all of his/her heart. So according to Jesus command, we want to win as many people for Him. The first visit to a church can make one a little nervous. It helps, therefore, to know more or less what to expect. Our services consist of preaching and worship. In addition, there is a children's program that goes parallel to it. 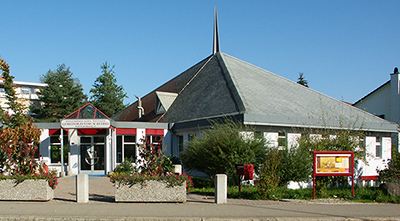 Gemeindezentrum Bethel is a free church and belongs to the Swiss Pentecostal Mission. The Pentecostal churches are the largest Christian denomination after the catholic church worldwide. Locally, we are part of the Evangelical Alliance Baden-Wettingen. Church is more than a service. Church means people who live their lives together and help each other to serve their respective locations. Each week people meet in smaller groups to learn more about God, pray, eat and have fun. We call these groups small groups - they are the heart of our community. We put our resources at your disposal so that you can grow as a disciple of Jesus. These materials can be accessed to in the form of audio (Mp3) and in Pdf. Jesus is the most generous person who has ever lived. He gave his life so that we can have life. As Christians, we give joyfully our time, talents, and our money in response to the generosity of Jesus, so that many people can get to know Jesus.